The presence of the Revolutionary Armed Forces of Colombia (FARC) is evident in Venezuela’s Amazon region, where the guerrillas can be seen on speed boats, in camps, or interacting with local indigenous communities. Almost a quarter of a million Colombians have been killed in the country's internal conflict since 1958, most of them civilians, a government-funded report has said. The United States and Colombia are the leaders in mental anxiety in the Americas. Both have good reasons: Colombia has witnessed the longest lasting violence in any contemporary country: from 1949, with some interruptions, then on again from 1964 with the notorious guerilla group, the FARC (Revolutionary Armed Forces of Colombia). Drugs and arms traffickers are muscling in on Colombia's Pacific coastal region, forcibly displacing local people, according to a new report by the Consultancy for Human Rights and Displacement (CODHES). Colombian government and guerrilla delegates have announced an agreement on the question of land reform – an important step in the peace talks that began six months ago in Havana. "I was displaced here by mining a month ago. Illegal miners forced me out of my municipality. No, don't write down where I'm from, let alone my name," said a 40-year-old black man frightened for his safety. IPS agreed to say only that he is from Colombia’s southern Pacific coast region. Colombia has suffered an internal armed conflict for so many decades that it almost amounts to a "forgotten crisis" for external donors. But the president of neighbouring Venezuela, Hugo Chavez, is well aware of the conflict, and understands that it destabilises Latin America, where centre-left governments proliferate. Scepticism, fear of expressing an opinion and a dash of hope make up the cocktail of responses from Colombians asked about the possibility of the decades-old civil war finally coming to an end as a result of the peace talks between the government and the FARC guerrillas, which began Monday in Havana. Closed-door talks between members of the FARC guerrillas and the Colombian government began in Oslo Wednesday, after the delegates were taken from the airport to an undisclosed location. 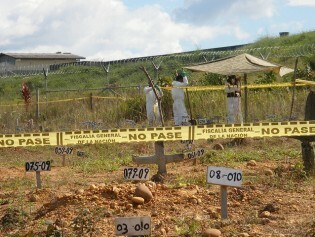 When 12 Colombian soldiers were killed by FARC insurgents a stone's throw away from the northern border with Venezuela, the consequences included military cooperation that reinforces the political, diplomatic and trade-related links that have developed over the past two years between Colombian President Juan Manuel Santos and Venezuelan President Hugo Chávez. There have been "few tangible improvements" in human rights in Colombia, says Amnesty International’s new report, which also points to legal loopholes that ensure impunity, as well as government attacks on court rulings. After Colombia's attorney general announced that she was bringing charges against a former government peace commissioner for his role in a staged surrender of a fake guerrilla unit, he called for an investigation of her husband – which she promptly ordered.